Ayutthaya was also deemed a world heritage site with the most problems of land encroachment, which was now beyond the control of Fine Arts Department officials, Khaisri said. The ministry will now ask for cooperation from the Ayutthaya governor to ensure the site was maintained according to Unesco criteria, she added. If the site was not taken care of or kept in good condition leading to its exclusion from the heritage list, it would be unfortunate and embarrassing, she said. It would send the message that Thais did not attach importance to their cultural heritage, while other countries were striving hard to have their cultural sites included on the World Heritage list, Khaisri said. She said the best groups that could take care of the Historic City of Ayutthaya and Associated Historic Towns were the local communities and urged them to keep a close watch on anything suspicious. Fine Arts Department Director-General Kriengkrai Sampatchalit said the Unesco World Heritage committee would inspect the ancient sites on the list to see how they were being maintained. He said that he had learned the committee was considering grading heritage sites according to a colour code. Red would mean the site was at risk of being removed from the list; yellow, would mean the site needed improvements, while green would denote a site in good condition, he said. He said the current problems could still be solved and he would soon discuss with all sides to resolve the issues. Fine Arts Office 3 director Anek Sihamat said the site’s inner area covering 1,800 rai – out of the total 6,000 rai where many important historical places such as Wat Phra Sri Sanpetch and Wat Ratcha Burana were situated – now had people building structures over these ancient sites. He cited as an example a lawsuit between his office and the local administration body and residents over an over-eight-metre-tall building, the construction of which was eventually aborted. Anek said that before the site’s inclusion in the heritage list, there were many land encroachments, but the authorities had tackled the problem and managed the area according to Unesco criteria. They had even moved an 11-metre building to outside the urban area and had state agencies’ offices located to a new city area. Earlier, Chao Sam Phraya Museum Director Subongkot Thongthongtip, said the site’s problems resulted from lack of proper control over city planning, which recently allowed high buildings to be built near the world heritage site, and urged that planning laws be strictly enforced. Subongkot said that she personally disbelieved the rumour that the site faces the threat of removal from the World Heritage list. She said Unesco regularly assesses the site and would surely warn authorities to improve the situation before taking the step of excluding the site from the list. The old capital Ayutthaya has been destroyed twice, first by the invading Burmese, and now by greedy and insensitive Thais. Culture Minister Khunying Khaisri Sriaroon has warned that Unesco might remove the historic city of Ayutthaya and associated historic towns from the World Heritage List following threats of encroachment from rapid development. The plundering of Ayutthaya by the Burmese in 1767 cannot be easily removed from Thai consciousness. It still haunts us today. Built in 1350, old Ayutthaya was one of the most beautiful cities on earth, with hundreds of temples and a great culture. When the Burmese invaded the city, it was burnt to the ground. “On April 28, 1767 the town was captured by assault. The treasures of the palace and the temples were nothing but heaps of ruins and ashes. The images of the gods were melted down and hidden, depriving the barbarian conquerors of the spoils that had aroused their greed. “To avenge this loss, the Burmese visited their heavy displeasure upon the town folk. They burnt the soles of their feet in order to make them reveal where they had concealed their wealth, and raped their weeping daughters before their very eyes. “The priests suspected of having concealed much wealth were pierced through and through with arrows and spears and several were beaten to death with heavy clubs. Whenever I visit Ayutthaya, I fall in love with the old capital even more. I like to have a meal at Krung Kao restaurant, which overlooks the river, and then set off on a long-tail boat around the city. It is a rewarding and enchanting experience. In my mind, I always try to imagine what that terrible day in Ayutthaya would have been like, and realise that if the Siamese had been less complacent they would have been able to save Ayutthaya from total ruin. It is always the big “if”. But along the way, save for the historical sites and temples, Ayutthaya is an ugly city. It has not benefited from any urban planning. The houses built on the banks of the rivers are badly designed. People have dumped their garbage into the waters. Several buildings do not follow the city code. Khaisri has received an initial report from the Fine Arts Department indicating that the site, which was included on Unesco’s World Heritage List in December 1991, has suffered from the lack of city planning. But this is virtually beyond the control of the Fine Arts Department. “If the site is not taken care of or kept in good condition, and if this leads to its exclusion from the Heritage list, it would be unfortunate and embarrassing,” she said. It would be a disgrace if Ayutthaya is not saved and protected. We do not have any sensitivity towards our cultural heritage. In fact, Ayutthaya should long ago have been subject to strict zoning, so that it could remain forever a World Heritage site. I have also been to Nara, the first capital of Japan. The Japanese look after Nara pretty well, although Nara’s grandeur is not to be compared with Ayutthaya. 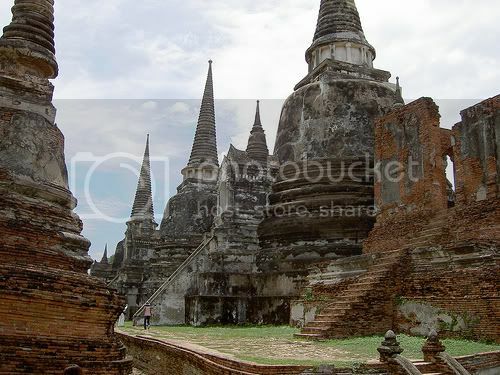 Ayutthaya and its associated towns cover an area of 6,000 rai. The site’s inner area covers 1,800 rai. Yet many important historical places such as Wat Phra Sri Sanpetch and Wat Ratcha Burana are now overshadowed by ugly modern buildings. If Ayutthaya were to be properly managed with greenery and zoning, it would be able to maintain its past grandeur so that all Thais can appreciate our heritage. Visitors from all over the world would love to come and see the handicrafts, the arts, the traditional dance and musical performances, the local products. We can’t move forward if we don’t know and protect our roots.